Wednesday June 10th 1925 Hattie away part of forenoon. I did not get up. I had letter from Lydia and L D L. Wrote W B McCall. Was up in PM. Hattie did not go to Missionary meeting. Rob away at supper time. Thursday June 11th 1925 I was up part of the time. I wrote Lydia and knit a little. Hattie home all day. Ott & Fannie here in the evening. Ott brought me a letter from Mrs Lowe. Friday June 12th 1925 I sat up and knit a little in forenoon. Hattie had a little part in afternoon. There was a shower, but did not prevent the ladies coming. I rested in Coras room. Rob brought me a letter from W B Mc--- at supper time. 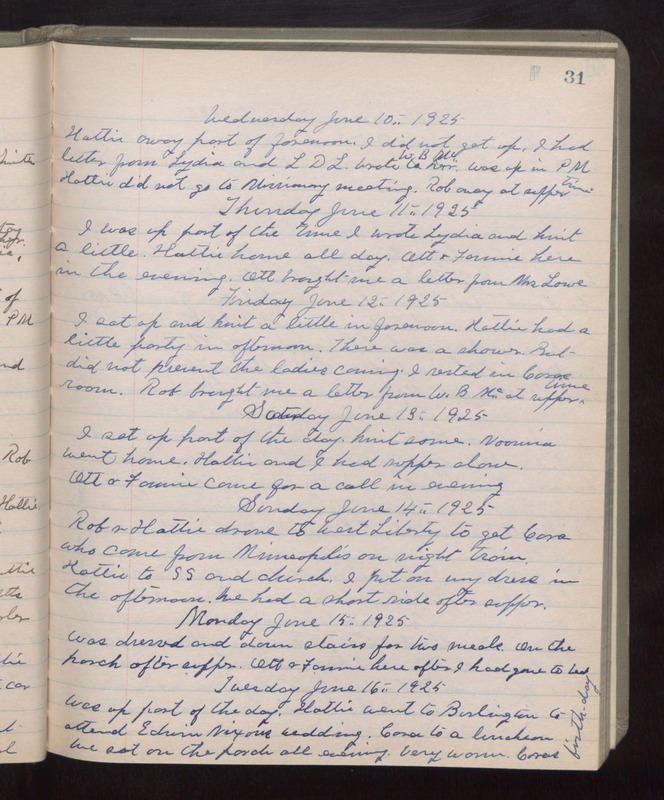 Saturday June 13th 1925 I sat up part of the day. Knit some. Noomia went home. Hattie and I had supper alone. Ott & Fannie came for a call in evening. Sunday June 14th 1925 Rob & Hattie drove to West Liberty to get Cora who came from Minneapolis on night train. Hattie to S S and church. I put on my dress in the afternoon. We had a short ride after supper. Monday June 15th 1925 Was dressed and down stairs for two meals. On the porch after supper. Ott & Fannie here after I had gone to bed. Tuesday June 16th 1925 Was up part of the day. Hattie went to Burlington to attend Edwin Nixons wedding. Cora to a luncheon. We sat on the porch all evening. very warm. Coras birthday.